If you're looking for something a little more interesting than a plain picture frame, it's easy to jazz up ordinary wooden frames using leftover seed beads. These frames are great for decorating an office or other drab spaces. This project is also a fun way to unify a bunch of mismatched frames that are in the same room. If you are using a plain wood frame, sand it lightly with sandpaper to get all the splinters out. Remove the back of the frame and the glass piece. Using the foam brush, apply glue to all the surfaces where you would like beads to stick. You can put beads just on the front or on the front and sides, if there are sides that stick out on the frame. Pour beads onto the frame, or pour beads out onto a plate, tray, or piece of newspaper and press the beads into the glue on the frame. Take time to make sure that all the glue is covered. Set the frame on a piece of newspaper or somewhere safe to dry. Wash out your foam brush and allow it to dry before proceeding. Use the brush to gently apply sealant to all the places where beads are. Allow to dry. The sealant will hold the beads in place more firmly and make it a little harder to knock the beads off the frame once it is dry. It will still be possible to knock beads off the frame even after this step. If this ever happens, repair the spot using the same procedure. Once the frame is dry, insert the glass piece, your picture, and the back of the frame. Mix in larger beads along with the seed beads. You could even add a small charm or other special beads. A glue gun may be required to get heavier beads to stick, however. 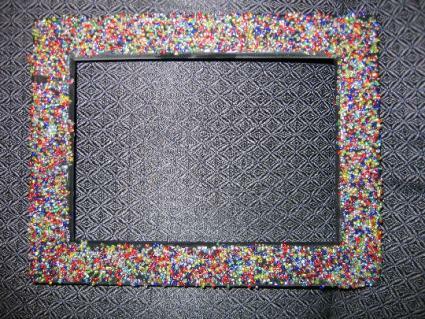 Try using different colored beads on each side of the frame. If you want to do this, work on one side at a time and allow each side to dry thoroughly before you work on the next one. Write a message in beads. You'll want to work with glue that comes in a squeeze bottle and write your message in glue. Working one letter at a time to add the beads is best. Allow this section to dry completely before decorating the rest of the frame. Once you start playing with the concept, you will come up with all sorts of cute ideas for decorating picture frames with beads. When you're done making frames for your home, consider creating a few to give as special gifts for friends and family.